Below is a brief description of other SFN departments that regularly work with the SFN Economic Development Department. Links and contact information are provided should you have any questions. The Lands & Leasing Office provides Land Management services to the community of Saugeen First Nation#29 which includes, but not limited to, lease & permit documents, registers all land documents, collect cottage lease fees, and updates and maintains Saugeen First Nation Geographical Information System (SFNGIS) to assist band members and various other SFN departments. For more information, please contact the department. The Employment & Training Office offers a variety of programs year round. Programs include the Youth Work Experience Program, Forestry Program, Amphitheatre Program, Amphitheatre Grounds Crew, Science & Technology, Computer Lab, Theory & Drafting Rooms, and a Woodshop. Also, many training opportunities are offer through the Employment & Training office for community members and SFN employees such as First Aid/CPR, WHMIS, Fall Arrest, Confined Spaces Training, H.A.A.M.B. funding information, etc. Sauble Park is privately owned and operated by the Saugeen First Nation Chief & Council. Sauble Park is a clean, shallow, family friendly beach and is approximately 3.7 kilometres in length. The park is located on South Sauble Beach and is maintained by seasonal Park Staff. The park employs full time Supervisors, Gate Workers, and Maintenance Workers to help keep the beach clean, tidy, and enjoyable for all. The park is open from late June until Labour Day weekend. Sauble Park is an unsupervised swimming area, swimming is at your own risk. Please observe all Park Rules & Regulations. These rules & regulations are place to ensure that everyone has a safe and enjoyable visit. Sauble park offers two permanent rest room structures and numerous portable toilets through out the beach. It is one of the few beaches that allow vehicles to drive and park along the length of the beach so please be mindful of our Rules & Regulations. If visiting, please respect the rules and respect Mother Earth by leaving the beach clean and intact. There are numerous garbage cans through out the beach for your convenience. For more information, please contact sauble.park@saugeen.org or the Economic Development Dept. A visit to Saugeen First Nation would not be complete without a stop at the Saugeen Amphitheatre. Located in the heart of the village, over looking the mighty Saugeen River is one of the most beautiful and scenic gardens in Western Ontario. Stone stairways and walkways, terraced gardens and an outdoor amphitheatre constructed of locally quarried stone overlook the Saugeen River quietly snaking its way in the distance. The word "Friendship" outlined in large white letters on a grassy area below the gardens underlines the focus of this quiet and tranquil park. A nature path winds its way down to the river's edge. The Saugeen First Nations Amphitheatre is visited by thousands of visitors each year and has become a popular spot for outdoor wedding ceremonies. 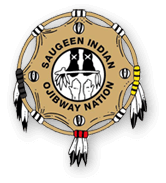 It is a continued source of great pride for the Saugeen First Nation members. The Amphitheatre is located along Hwy 21 in the Saugeen First Nation. You will see a wooden sign at the entrance to the parking lot on the south side of the highway. There is no admission fee. For information on the reconstruction project, please contact our Employment & Training Centre. For event booking information, please contact our Economic Development Dept. The Mandate of Cancom Security is to OBSERVE, REPORT AND DETER. We can be contacted at 519-379-5332 during our hours of operations from 2pm – 2am. You can also find information on our new website www.saugeensecurityservices.com. Operating hours will vary due to service requests. Please do not call this number for emergencies. All Emergencies must go through 911 (POLICE, FIRE and AMBULANCE). Band members are encouraged to call Security for all safety related matters for prevention.